While Hoosiers could encounter the lone star tick in any suitable habitat in the state, it is most typically found in the damp wooded areas in southern Indiana. 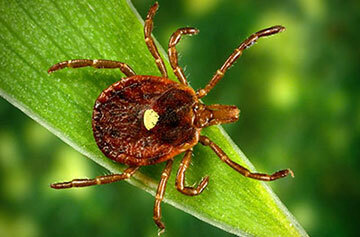 In fact, this is the second most commonly encountered tick by humans, coming in right behind the dog tick. One reason the lone star tick is the second most common tick found on humans is because it is the medium-sized species of the three we are focusing on. It is closer in size to the dog tick than the blacklegged tick. And, just like the other two types of ticks, the adult female is the largest of any of the lone star tick’s stages.